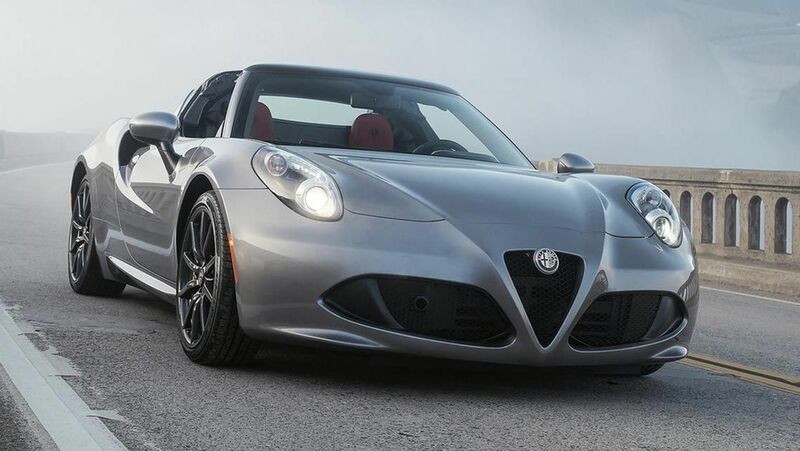 The Alfa Romeo 4c coupe was already a star amongst italian muscle car enthusiasts. Along comes the Spider and drivers are losing their… hats. Seriously though, you can go top down in this one. While some rate it as expensive, others say it’s quite the deal with the power and handling you get. In fact, some drivers say the only sin may be making a car with this much punch and giving it an automatic transmission! If you’re buying or selling an Alfa Romeo, have a scroll and see how the Coupe and Spider match up, as well as some of the rivals. We offer cash for cars too so once you’ve equipped yourself with all you need to know about selling an Alfa Romeo, don’t hesitate to call, we’ll make it easy for you. Pricing is pretty simple. The Coupe starts at $89,000 and the Spider comes in at $99,000. If the Spider isn’t sporty enough for you then you can tack on another ten grand for the Race pack which gives it bigger wheels and stiffer suspension. Is this a pricey ride? Check out the specs below and decide for yourself. Some driver’s are all about luxury features and entertainment systems that make driving easy and pass the time. The Spider isn’t a car for those drivers. The Spider is a car for diver’s that enjoy the drive itself. It’s definitely a thrills over frills kind of vehicle. For instance, you’ve got to like the contact of turning and actual key in the ignition rather than the push button many of us are getting used to. You’ve also got to enjoy the growls and roars of the engine as noise cancelling isn’t a valued feature here. While it may be basic in terms of extras, it isn’t archaic by any means. You’ll still enjoy leather trim sporty seats, bluetooth connectivity with a four-speaker system, rear parking sensors and 17 to 18 inch wheels from front to back. As noted in the price section, if you opt in for the Race pack then wheels are 18 to 19 inch alloys from front to back and you’ll have a more robust exhaust system and stiffer suspension. Other than the removable soft top and the slightly smoother design, it’s hard to find any big differences between the Coupe and the Spider on paper. Except for the ten thousand dollars of course. Let’s just say we wouldn’t exactly call this a family vehicle. There’s a squishy two-seater cabin with a true racecar feel and an even tinier 110 litre boot. Not the car for camping style road trips but perfect for flying down the highway with swimmers and sunnies and not much else. The Carbon fibre structure is recognised as a safe option but you’ll only get airbags in the front seats. Other than cruise control it’s hard to make out any real safety package with the Spider. Perhaps that’s why we don’t see an ANCAP rating yet. Again, probably not your best pick for a growing family. The Spider has a 1.7 litre four-cylinder turbo petrol engine with a six-speed dual-clutch automatic only transmission option. This rear-wheel-drive makes 177kW at 6000 rpm and 350 nM around 3000 rpm give or take. Between 3000 to 5000 rpms is the sweet spot as it tends to wane once you get up to the 6500 area where you might notice some turbo lag. For those imagining themselves on the racetrack, you can go from zero to 100 km in 4.5 seconds. Not bad. The official claim is 6.8L per 100km. Not so terrible for a punchy sports vehicle but also not great if you’re trying to be economical. There is a reported combined carbon dioxide emissions of 161g/km. Warranty is a standard 3 years or 150,000 kms with servicing annually or every 20,000 kms. Pros: Seamless paddle shift, stellar brakes, nice aesthetic. Extremely fun for the sporty driver who doesn’t care about luxury features and is more into the thrill of driving. Cons: No satellite navigation, touchscreen, or voice controls. Lengthy process to remove the roof. No option for manual transmission and no safety package.